Clindamycin is a broad-spectrum antibiotic, which is effective against a wide variety of bacterial and protozoal organisms. It is used to treat infections in most parts of the body, including skin, bone, respiratory, and dental infections. It is the drug of choice for the treatment of Toxoplamosis (an infection caused by protozoa). When clindamycin is used to treat a serious infection caused by multiple types of bacteria, it may be combined with other antibiotics. Oral clindamycin reaches high drug concentrations in most tissues of the body, even areas that are difficult to penetrate such as bones, joints, abscesses, and the central nervous system. 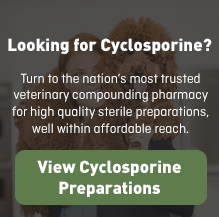 Clindamycin is FDA approved for use in dogs and cats. When the appropriate form or dose of this drug is not available through a veterinary pharmaceutical manufacturer, it may be compounded by a specialty pharmacy. In the case of clindamycin, the compounded product may be used to improve palatability. Give this medication to your pet exactly as your veterinarian prescribes. If you miss giving your pet a dose of clindamycin, give the next dose as soon as you remember or, if it is close to the next scheduled dose, return to the regular schedule. Do not double dose to catch up. Oral clindamycin can cause damage to the internal lining of the esophagus. This is particularly true in cats. If you are giving your pet a pill form of clindamycin, be sure to “wash it down” with some soft food or liquid. Clindamycin may be given with food. The presence of food affects how quickly the clindamycin is absorbed, but it does not affect how much of the clindamycin is absorbed. The most common side effects in dogs and cats are gastrointestinal (GI upset, including nausea and vomiting). These side effects appear to be due to local GI irritation. Injectable clindamycin does not cause GI distress. Injectable clindamycin may cause pain at the injection site. Keep this and all drugs out of reach of children. This drug should only be given to the animal for which it was prescribed. Do not give this medication to a person. Pets with severe kidney or liver problems require extra precautions and may need to receive a lower dose of clindamycin. 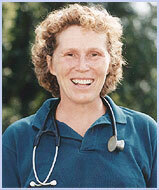 Your veterinarian might choose to perform additional blood tests while your animal is receiving treatment. Clindamycin crosses the placenta and is present in milk. Nursing puppies or kittens may develop diarrhea if their mother is receiving clindamycin. The following drugs may interact with clindamycin: neuromuscular blocking agents such as pancuronium, cyclosporine, and erythromycin. If you suspect that your pet or another animal has been accidentally overdosed or has eaten this medication inadvertently, contact your veterinarian or the A.S.P.C.A.’s Animal Poison Control Center at 888.426.4435. Always have the prescription container with you when you take your pet for treatment. Different strengths or dosage forms of clindamycin may have different storage requirements. Read the label or ask your pharmacist for the storage requirements of the prescription you receive.